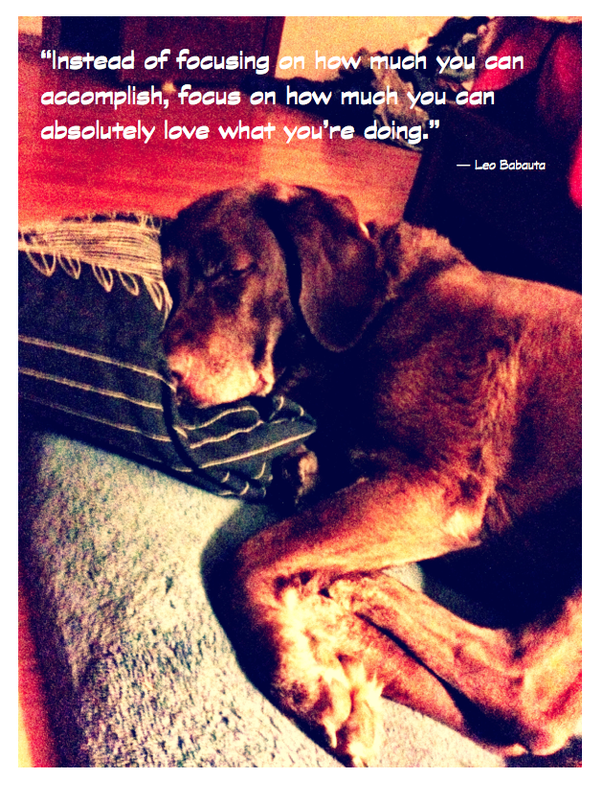 Passion – How Finding Your Element Really IS What it’s All About! Our fifth grade students are two weeks out from their culminating project as PYP students: the Exhibition. We chose to focus on our passions with the understanding that pursuing your passion emboldens you as a learner and enables you to connect with others. When we began our journey, we were guided by a number of excellent resources. 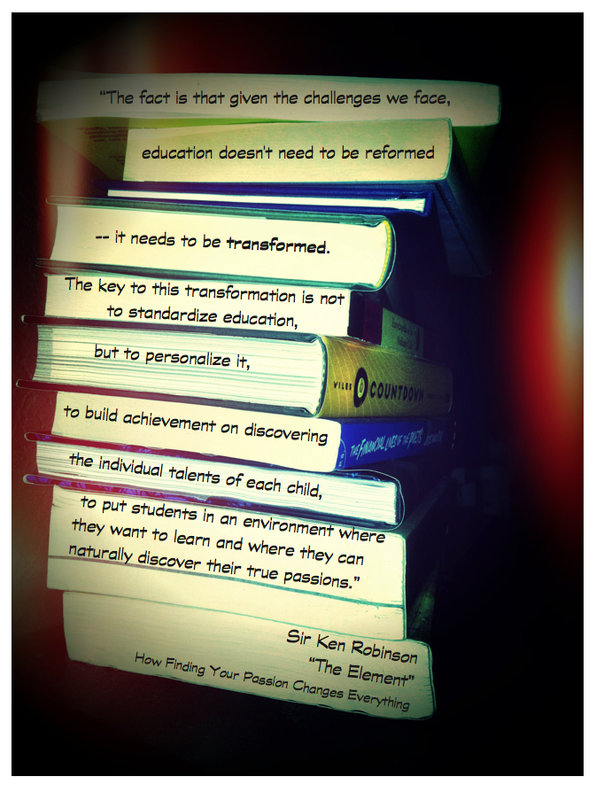 As a teacher, I was inspired by (and somewhat enamoured with) Sir Ken Robinson. Having first heard of him whilst teaching in Thailand, the ‘buzz’ generated by his TED talk was a loud roar. He was amazing, insightful and inspiring. This live talk was followed up with an animated version, utilizing the now more common-place skill of visual notetaking. To have the opportunity to hear him speak, live, in Boise thanks to the ED Sessions – priceless. I would add ‘witty’, ‘dry’, and ‘freaking hilarious’ to my previous descriptors of Sir Ken. His talk was the first in a series of three titled ‘Reading, Writing, Revolution’ and he certainly started one! His talk was a month or two before we would begin planning for the Exhibition and that was enough time for further reading of “The Element” and “Out of Our Minds” and for the ideas he shared to percolate. 5. Learn, ask, take notes. Great advice, fully explained in his post and very worthwhile. 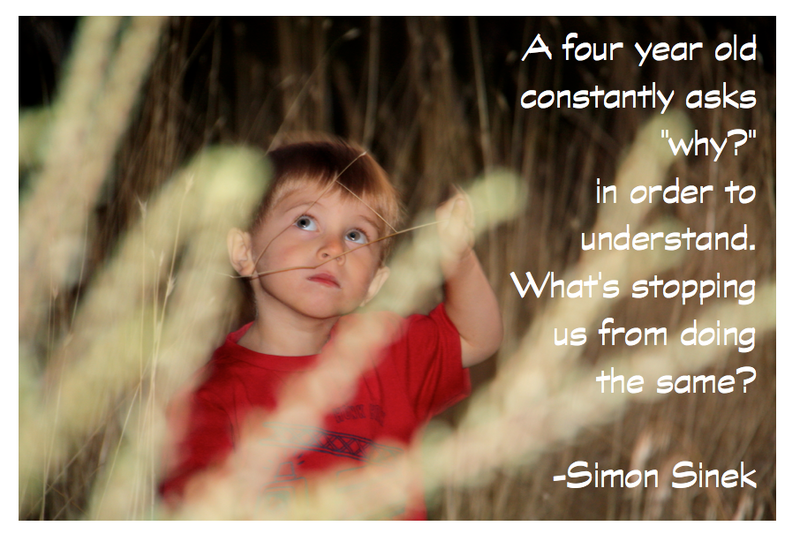 Simon is our “why” guy. He advocates that we should ‘start with why‘ and in doing so, will discover our purpose. Find out what you like to do, how you do it and then consider why you do what you do, how you do it. We were fortunate at this point to have two things: firstly, an amazing Passion Tour of Boise where we got to meet 9 amazing people who can truly say they are living out their passion: a conductor, a vet, an academy award winning director, a dog trainer, CEO of the YMCA, a businessman, an engineer, and two gals with a passion for fashion. Secondly, we had a parent who works with people and organizations to help them define their purpose and connect them with their best ideas. With these elements combined, we had a wealth of examples and the know-how to help our kids define their ‘why’ on their journey to identifying their passion. You know no post is complete without a mention of Seth! 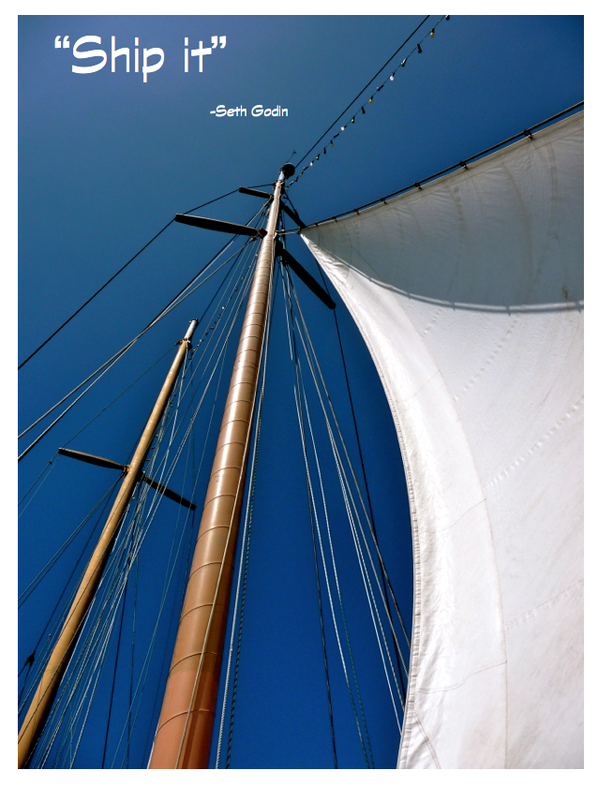 Having read “Linchpin” I was excited to see the follow-up workbook “Ship It“. Once our passions were defined, Ship It was a great addition to our toolkit thanks to Seth’s generosity in letting us copy this out-of-print resource. Ship It cuts to the nuts and bolts. It makes you write your shipping date, articulate your fears, add and subtract from your project to increase awesomeness and really set yourself up for a successful journey. Having filled in our Ship It books, we wrote ourselves a letter to read the day before the Exhibition. As Seth said, we could save the space for writing what actually happened or we could speak truth into the future. We chose the latter and are excited to open our letters on March 21st. With all that in mind, what will you see when you walk in our rooms? You will see passion. Actually, you will see PASSION. It is amazing. There have been moments when we have thought it was all going to be a giant mess. There have been talks with the kids and talks amongst the two of us who teach fifth grade. And then there are our kids. What are they doing? Some you won’t see at all! They are off flying in small areoplanes, making little libraries to install in our community, running sports camps, participating in personal training sessions, off in their own world writing or creating works of art, learning an instrument, composing music or investigating the physics of dragons! And did I mention these kids are ten and eleven years old? As for their teachers? We are on cloud nine and are unanimous in our belief that this is the best teaching of our lives. Seeing our kids so engaged and hearing them articulate their journey has been amazing. True, it has been scary and there have been times when we were so unsure where it was all heading, but it is apt that it is Spring in Boise as our kids really are (cheesy, but true!) blooming. They are in their element and their work is not work anymore. When we say “Exhibition time” there are fist pumps and the rapid dispersal of 28 small bodies within our two classes, in the hallways or in the sunshine outside. Kids are helping each other, volunteering to take surveys, edit each others work, teach a new tech skill – anything to help move another forward in their passion. Personally, I have found great strength and encouragement from the relationship I have with my fellow fifth grade teacher. I taught fourth grade last year so many of the parents knew me and liked working with me. However, I look back on ‘that person’ that I was as a fourth grade teacher and there are many things I don’t recognize in the fifth grade teacher that I am now. I know that a lot of this is due to having read more, become more connected and just a factor of chronological growth over time. The bulk of the change, however, lies in working with someone who shares your values, has the best interests of the children at heart, is open to change, will readily share everything and who always has your back. Collaboration – one of the 4 C’s of 21st Century learning – is not easy. It is made to look like child’s play when respect, professionalism, dedication, and (let’s be honest) a constant stream of hot coffee are on had at all times! I learned on Friday that my friend and colleague with whom I have shared this amazing journey, will not be returning to our school next year and as corny as it may sound, I spent the bulk of my weekend mourning the loss of someone whom I have learned so much with this year. I can be one to ‘make a ruckus’ as Seth would encourage us all to do. When the enriching, thought-provoking, stimulating, inquiry-based and passion-driven learning environment that you have worked so hard to create is threatened, is there anything more important for one to make a ruckus about? 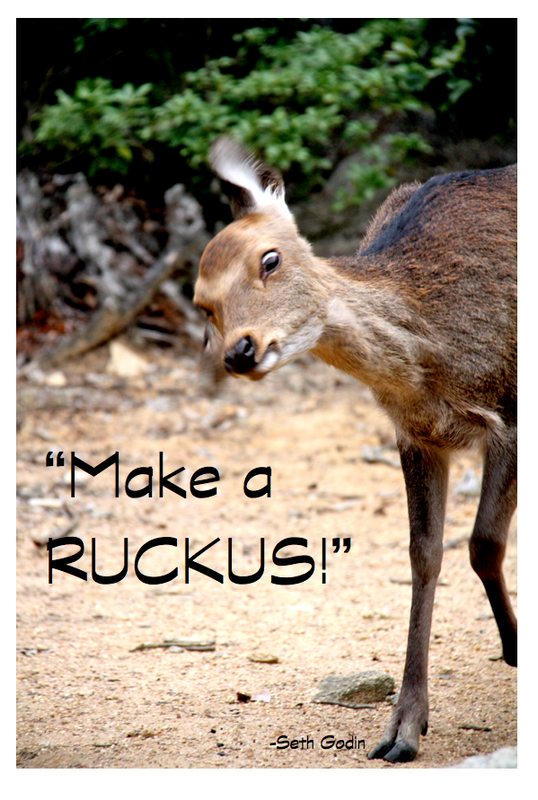 Perhaps ‘making a ruckus’ is my new Passion? Previous postCare More. Even through Change. Care MORE. Next postAuthenticity – Do You Practice What You Preach? Sonya: Your kids sound like they’re doing amazing work. Hage they chosen their passions? I would love to have a conversation with you about how to get the kids more excited about different passions. At the beginning of our Exhibition, the Japanese teachers took hold and worked the kids ito different passions. All of my children ended up doing sports. I’d like to approach the beginning of the Exhibition differently next year so they take some time to really feel out their passion. And the action component? I think your passion tour and the parent who came in to talk about how people find their purpose really helped. Great job!